Dinner Friday and Saturday 6-9 pm. 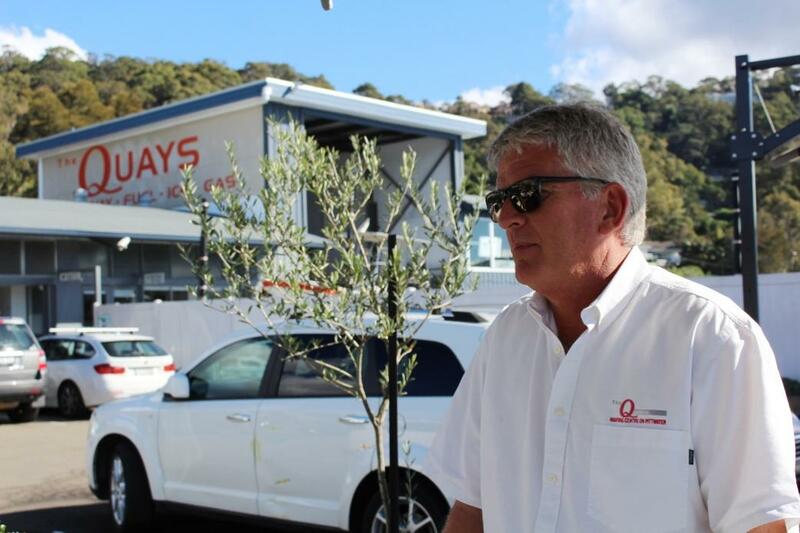 Located within The Quays Marina at Church Point, recent Clean Marina awards recipients, the Marina Café continues our search for somewhere, in each Pittwater suburb, we may take along our growing bigger puppy, Matilda, while we enjoy excellent food and a spot of bubbly in the sun. 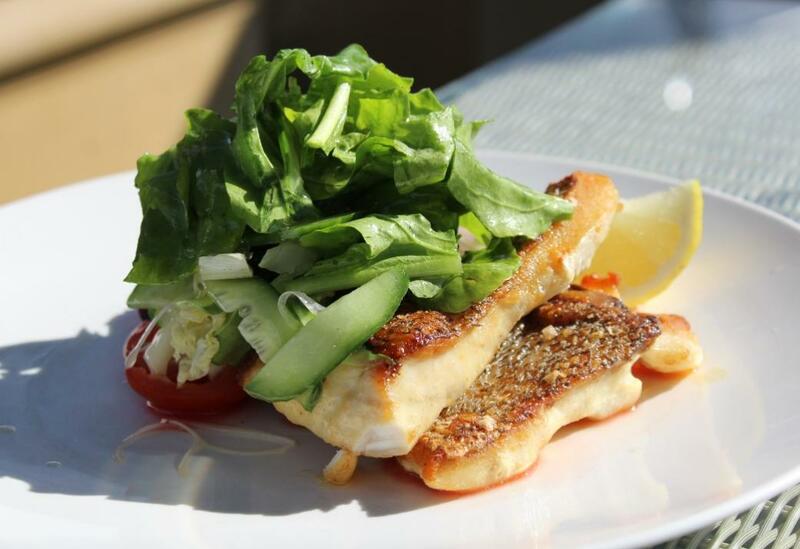 The Marina Café, Church Point sources market fresh produce daily to create beautiful modern cuisine. Open for breakfast and lunch 7 days as well as hosting dinners on Friday and Saturday nights, a change of menu with the seasons to take advantage of the best produce on offer means you will always find something superb to feast on while enjoying waterside peace and quiet. We arrived in time to be among the early lunch diners on a Saturday of pristine Pittwater perfection. After a catch-up with Stephen Hosking, Manager of The Quays, we both ordered fresh fish dishes and a bottle of one of our favourites, Janzs’ Tasmanian Premium Cuvee. There’s a great drinks menu with everything from coffees and premium juices to locally produced premium beers (Modus Operandi – Mona Vale) and the best Australian wines. Choosing something light for lunch meant our selections focused on seafood and fresh fish. Fish Dish One was a New Zealand Hāpuku, or whapuku, described locally as cod, which was pan fried. Fish Dish Two selected was char grilled Bluefin Tuna. With these there were four choices of accompaniments – handcut chips made on the premises, roasted vegetables with a Salsa Verde, a green salad loaded up with wedges of fresh avocado, or a Thai style green papaya salad with generous lashings of caramelised onions on the side. We chose the salad options and ordered a side of the handcut chips for the table - a big bowl of crisp, hot wedges of fresh potato served with aioli. Both meals were scrumptious – the tuna served medium rare, the Hāpuku with skin left on for a nice crisp optimisation of this white fleshed fish. If fish is not to your taste you can choose from an Eggplant, capsicum, basil and goats cheese roulade served with an olive tapenade and sourdough toast, a Crispy Duck Salad with watermelon, cucumber, roasted cashews, Thai basil, chilli jam and fresh lime, Twice cooked Lamb Shoulder with jaew and a fresh herb salad or the Cape Grim oyster blade braised steak char grilled with sauce vierge and almond tarator. Salt & pepper squid with a sweet chilli and lime dipping sauce, Boston Bay mussels with apple cider, garlic, thyme, fennel and basil served with sourdough toast or House-made spaghetti with Coorong pipis, white wine, garlic, chilli, parsley and bottarga round out the other seafood options. The Marina Café creates all their own jams, chutneys, sauces, cakes, muffins, tarts, ice cream plus more in house – ensuring the freshest and most delicious tasting dishes. 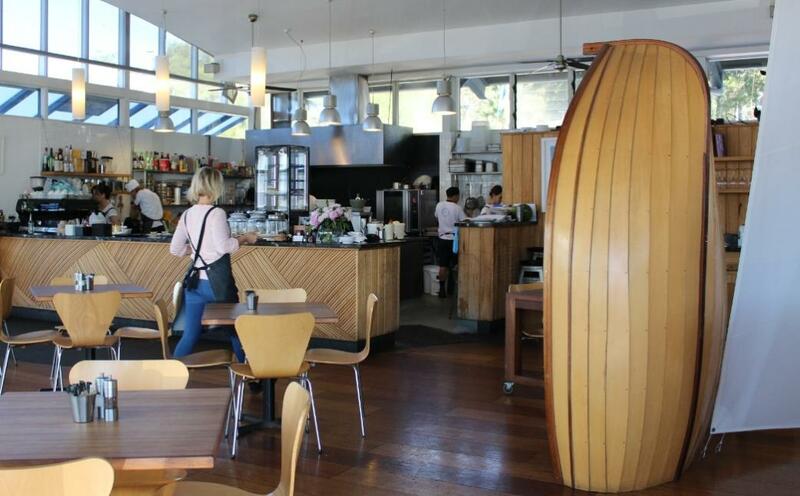 The Marina Café also hosts functions and offers catering as well as sells a range of these scrumptious jams and condiments if you want to take some home or give a unique gift from the foreshores of Pittwater. The portions were so generous we couldn’t fit in desert but there’s always something sweet and excellent available for those who can. 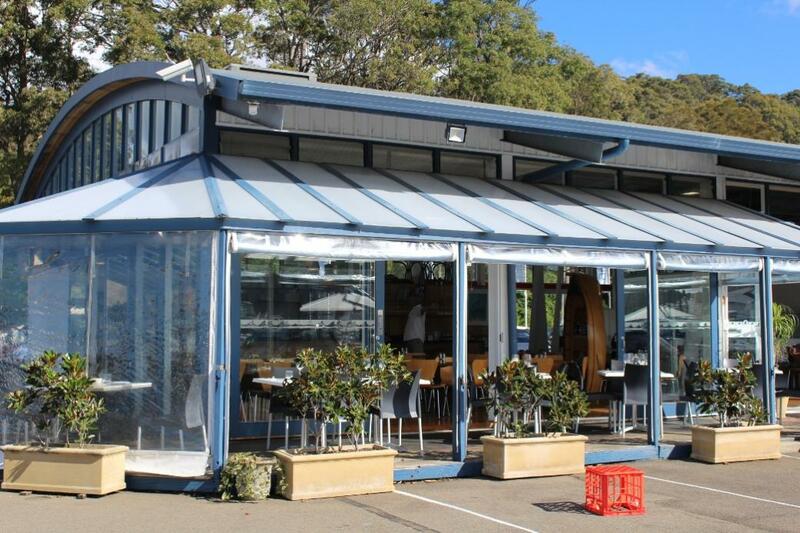 On such a glorious Pittwater day, blue skies meeting blue water, it’s no surprise that the outside dockside tables were full – we suggest booking a table for weekends although we were lucky and arrived between the changeover from breakfast to lunch and secured the table we wanted. Wonderful late Autumn – early Winter fare in a lovely nook of Pittwater. We’ll be back to try out the menu again during the warmer months. New Zealand Hāpuku with a Green Salad. Stephen Hosking, Manager of The Quays Marina, Church Point - pauses for quick 'welcome back' before on to other duties. To list your business, have a Pittwater Online News Food page run, or place a logo on the Pittwater Online News Food page, please contact us with details of your requirements. Logos may be embedded to redirect to your own website. Full pages include an overview of menus as well as beautiful images to make the food sampled look its best. Pages are archived into Permanent pages past their week of Issue.